This exterior door is composed of eight panels, all the same size. These panels are equally distanced on the face of the door and separated by three horizontal rails. All the panels are raised, though they have no additional molding or decoration. In the center of the mid rail, a shiny brass mail slot has been installed. The door's handle and lock are both mounted onto a shiny brass plate. 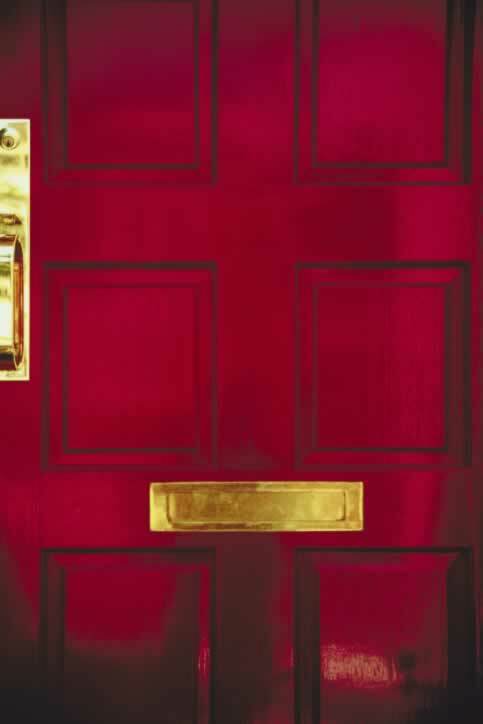 The brass stands out against the wooden door's cherry red finish. Additional matching hardware such as a brass kick plate or a classic door knocker would be a good addition to the door while still keeping with the owner's original vision. A brass kick plate is a particularly good choice for doors such as this one that has been recently refinished, as plates tend to protect doors from shoes and furniture scuffing the finish.